John Crane provides a wide range of training courses — including seal training and coupling training — that cover the correct procedures for installing, operating and maintaining equipment components. These comprehensive training courses give end-user personnel, such as engineers, technicians, operators and mechanics, the knowledge necessary to optimize uptime by keeping their equipment running safely, smoothly and reliably. The safety, performance and reliability of energy services and industrial process plants directly depend on proper training. Training courses may be conducted at fully equipped John Crane facilities or on-site at the customer’s location, and are led by seasoned John Crane engineers with real-world experience. Course materials are specific to scenarios and applications, not generalized, which contributes to attendees’ working knowledge of critical components and facilitates effective on-the-job troubleshooting and problem solving. By combining hands-on labs with classroom theory and group exercises, attendees can experience complex procedures from every angle. Regular testing during the course helps reinforce information retention, and each attendee is awarded a certificate upon completion. Select programs also provide pre- and post-learning exercises to extend instruction beyond the classroom. Two of the main factors leading to inefficient system operation are the lack of qualified personnel and limited specialist training programs. Effective training delivers improved performance, reduced operating costs, better co-operation and planning, and enhanced safety. Courses can be held in customer offices, hotel conference facilities or on-site at production facilities, both onshore and offshore. 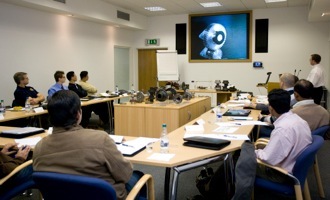 Alternatively we can arrange to hold courses at one of our global training centers.